As the title of this post suggests, no real significant movement over the past month or since the RBA dropped its cash rate down by 25bps. 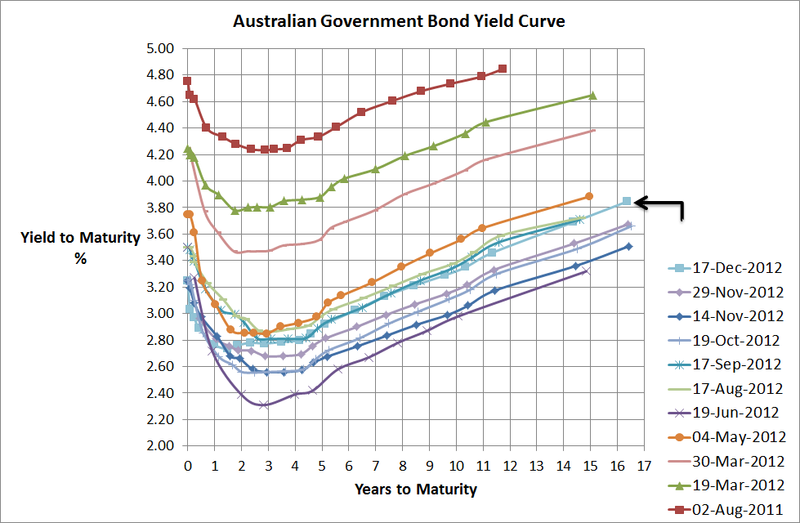 The yield curve has improved marginally but overall its still within its trading range that was more or less set between May and June this year when the Euro crisis started to blow up again. Sharemarkets and bond markets have undoubtedly been calm and there has been some good employment numbers come out of the US and some mixed numbers out of China, whilst Europe continues its expected spiral into deeper depression. Interestingly, ANZ came out over the last day or two with expectations that the RBA will drop the cash rate to 2%. Definitely possible but at this stage not even the bond market appears that bearish on the economy with current prices suggesting a reduction down to 2.5% as the more likely rate over the next 6 to 12 months.